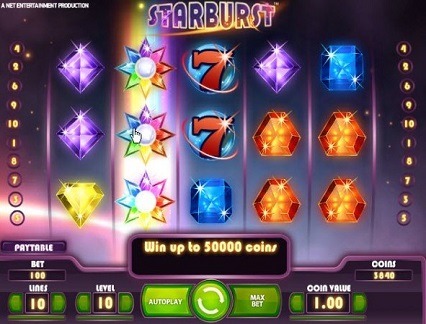 Game Information: Starburst is one of the newer themed sots from cutting edge casino software provider Net Entertainment. Starburst features a cool retro-looking gaming interface featuring 5 reels and 10 pay lines. One of the most notable features of this particular game is that there is no actual bonus round and fans of more straightforward pokies will love this title! NetEnt have produced a simple and exciting game that offers great visual appeal as well as a few interesting game innovations to help keep things interesting, and to make up for the lack of an actual bonus round. Starburst offers one of the most flexible wagering options of almost any pokie, making it ideal for all levels of budget as well as all levels of experience, thanks to its easy to understand gameplay. One of the most unusual features of Starburst is how winning combinations pay. 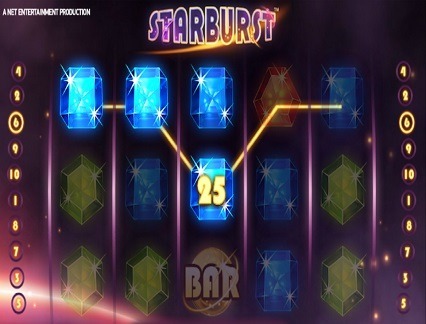 Normally in most pokies, wins are calculated from left to right, in Starburst wins can be calculated from left to right and right to left and are then multiplied by the number of coins that you decide to wager per line. Players can wager a single coin per line or as many as ten (the maximum). Coin sizes are also extremely flexible and there is a size to suit all players, ranging from the minimum of $0.01 and going up $0.02, $0.05, $0.10, $0.20, $0.50 and the largest $1.00. Being able to vary the amount of coins per line as well as the number of lines in play means that players on tight budgets can happily wager $0.01 per spins while high rollers can choose a flexible max bet of either $1.00 or $100 per spin. In Starburst the wild symbol is the Starburst logo and this symbol can be used to substitute other game symbols to make very strong winning combinations. The Starburst wild symbol found on reels 2, 3 and 4 automatically expands, transforming into an awesome stacked wild. The stacked Starburst wild symbols can also trigger a free sins round when they are on reels 2, 3 and 4 and stay in place during the free spins round. It is also possible to retrigger the free sons round up to three times when more stacked wilds appear. Starburst is all about a glitzy and sparkly world filled with precious gems and plenty of bling. The game has a really retro, almost eighties feel to it and includes classic slot symbols such as the lucky 7 and the bar, with opulent jewels and general shininess. The game also features a cool (although some would say cheesy) eighties soundtrack of electronic pop which perfectly complements the overall look and feel of the game. All in all, this game will certainly appeal to loves of eighties inspired kitsch and the world of gilts and glam fun. While Starburst is not a progressive jackpot pokie and offers a medium volatility which many players would appreciate, the game still offer a respectable maximum jackpot of 50,000 coins. This can occur when playing on max bet and max coin size and all 5 reels display the 3x Starburst stacked wild symbols. Starburst offers a 96% return to player which is also above average.